Three Libyan Pilots and six Libyan Tug Masters have successfully completed training in general ship handling and general tug handling respectively. The group of foreign pilots and tug masters were the first foreigners to receive training at the state-of-the-art ship handling simulator at the Mediterranean Maritime Research and Training Centre in Marsa, Malta. The Minister for Transport Minister Joe Mizzi distributed the certificates to one group of the trainees consisting of one maritime pilot and two tug masters. He announced that in the coming days more foreign maritime pilots and tug masters will be heading towards Malta to receive similar training. The training is divided into two modules – the theoretical aspect and the hands-on training for pilots. The topics covered in the training include: general ship handling principles; squat & interaction; rudder effect and types of rudders; turning circles; transverse thrust; wind effect; pivot point when going ahead or astern; positioning of tugs when manoeuvring in confined areas; use of anchors in a manoeuvre and use of mooring lines. The training also includes ship handling simulation in various weather and sea conditions. 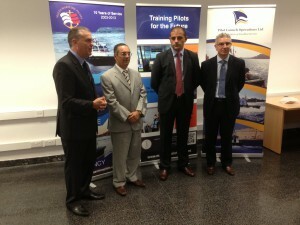 Maritime pilots are also provided on-the-job training. Candidates are given the opportunity to be present on board ships (small Bulk carriers, Tankers, Passenger Ships and Container Ships as large as 400 metres) entering Marsaxlokk Port and Valletta Port accompanied by the maritime pilot on duty.